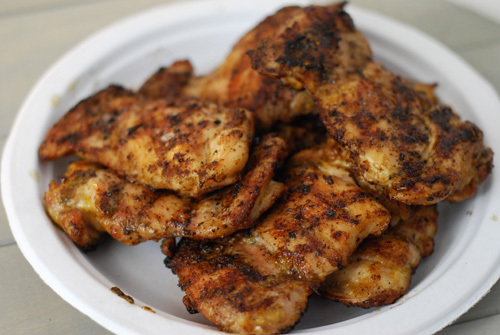 I have a favorite jerk chicken recipe that I like to use that produces great jerk chicken. The only downside is that is has some 19 ingredients and needs about 6 hours marinade time. Not exactly conducive to making on a weeknight. 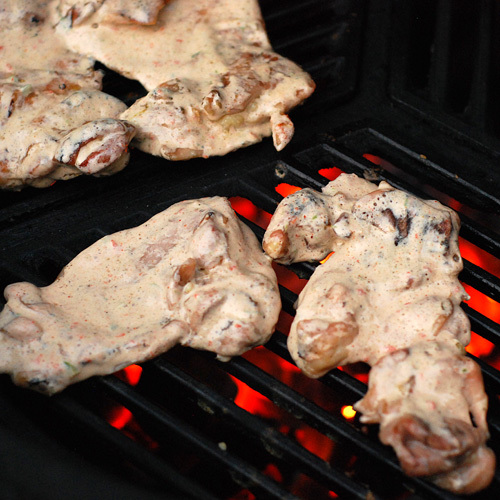 So last week I had this weird idea of combining something like an Alabama white sauce (ala Big Bob Gibson's) with Dizzy Pig's Jamaican Firewalk seasoning for some quick "dip and flip" chicken thighs. 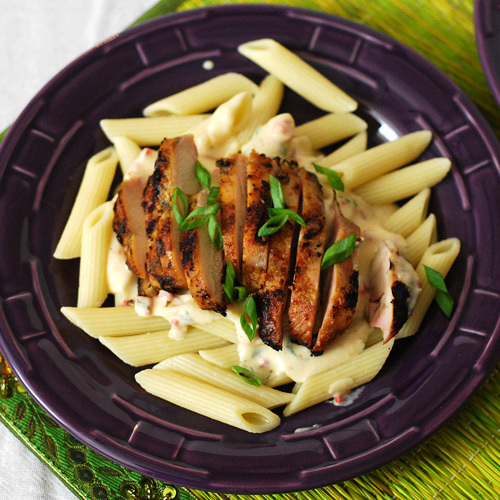 Only 5 ingredients and no marinade time needed. It actually worked out very well with the chicken having that classic earthy flavor of jerk seasonings, a little tang, and some heat. 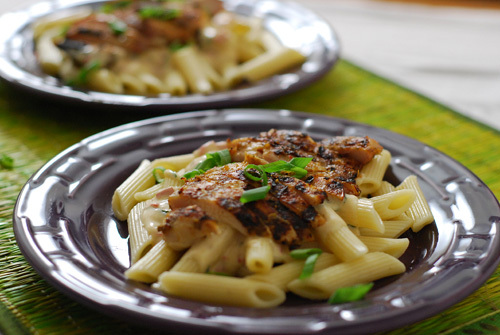 The chicken is good enough by itself but we also used it in a cheesy pasta dish that we aptly named Firewalk Pasta. Make the dip & flip sauce. Combine all ingredients in a blender, Magic Bullet, Ninja, mini-processor or other implement of destruction. Make the pasta sauce. Stir butter and flour together in a sauce pan over medium heat to form a blonde roux (about 1 minute). Whisk in the half and half, bring to a simmer and simmer for 5 minutes whisking frequently. Whisk in the cheese in batches until blended. Whisk in the cilantro, red pepper, and Firewalk. Cover and remove from heat. Preheat a charcoal grill to 400f. Make sure your grate is clean and lightly oiled. Grill the thighs 3 minutes per side. Remove each thigh, dip into the sauce, flip to coat both sides and return to grill, cooking another minute per side. Dip and flip again. Finish cooking chicken until it reaches an internal temp of 165-170f (thighs can handle it) which should be another 2-ish minutes. 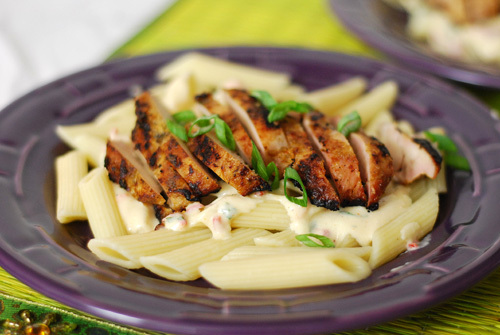 To serve: Top pasta with the sauce, then sliced chicken and garish with more slice green onion if desired. I like to start my water boiling for my pasta just before starting the grill. That way the pasta should be done about the same time as the chicken. I tried using sour cream instead of mayo in one version. It was okay but the mayo versions were much better. The sauce will cook onto the chicken and it will end up looking normal. 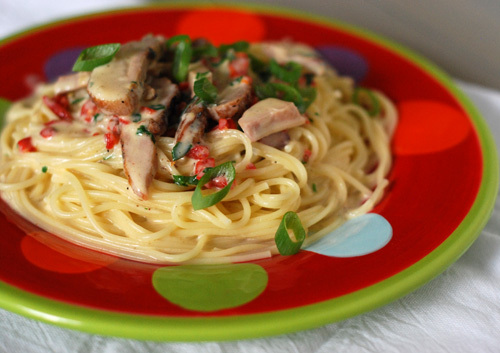 The first version was with angel hair pasta. We liked it with penne better although both worked. 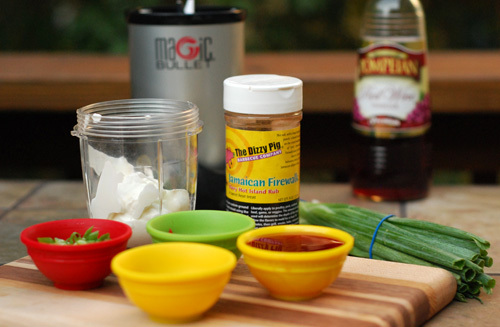 The "dip and flip" layers the flavors onto the chicken and skips the wait involved with a marinade. I have to admit that it also keeps me entertained at the grill. I'll still use my standard jerk recipe on weekends but this is definitely a keeper for quick "almost jerk" chicken on weeknights. Good luck to all of my friends participating in the American Royal events this weekend! [Standard Disclaimer] I paid full price for the 4 Dizzy Pig rubs that we regularly use.